The Bin Warehouse was designed with the idea of assisting people in finding solutions to their closet organization, home storage, and office storage problems. While plastic storage bins and file box containers were a great solution, however storing these containers created another headache. So the Bin Warehouse was born. A racking system or closet organizer designed specifically for plastic storage bins, totes, or file boxes. The Bin Warehouse comes in three specific models. The 8 storage tote unit is great as a closet organizer, the 12 unit model is perfect for garage or basement storage, and the File Box Unit is the answer to your office storage solution problems. 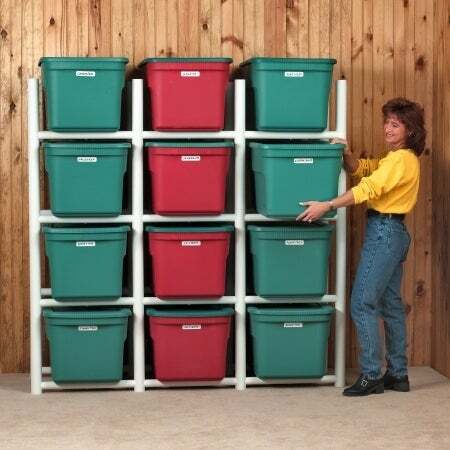 PVC; Sturdy Construction; Holds 12 Large Totes; Easy Assembly; Allows Totes To Be Accessed Easily; Comes Complete With All Hardware to Mount To Any Wall. For upto 32 gallon bins. Bins not included. Assembled Unit Dimensions: 69 inch H X 68 inch W X 27.5 inch D.
I don't know how we were getting along without this system. It has made life easier and its very sturdy. Don’t panic when you don’t see the hardware when you lay out all of the parts. per the instructions, The screws were in one of the poles. I was able to put this together by myself by watching a YouTube video which provided a few extra tips on installation. I love this product and am considering purchasing a second set. Love the space it saves. Wish I knew about it years ago. "How much weight will the unit hold?" "Can anyone tell me what gallon size storage containers fit this unit or give me the dimensions of an opening?" It says in the description up to 32 gallon baskets/ totes. "What size storage bins fit this system. I need length width and height."